I finally get to share my new book, Show Your Colors with my bead friends in Tucson this coming week! Woohoo! Demos and Book Signing with both Jamie and I! Thursday ***Please note that I will not be available on Thursday! Show Your Colors will be available for sale in the Soft Flex booth at the Best Best Show in Tucson, Arizona this Spring. Both Jamie Hogsett and I will be on hand demo-ing too! It is a great opportunity to get your book signed by both of us in person. 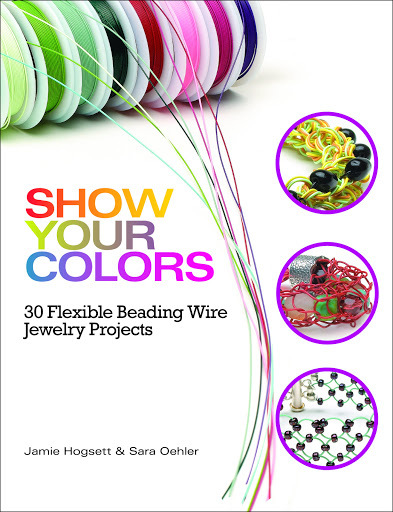 Stop by the Kalmbach Publishing booth at To Bead True Blue between 2-3pm on February 2nd to check out my demos and learn more about Show Your Colors. If you can’t make it to Tucson, you can still pick up a copy of our book on the Soft Flex Company website!